Neighbors, and those who travel through the Brentwood-Darlington neighborhood intersection of S.E. 72nd Avenue and Duke Street, wonder if it is located in some sort of "vortex of unluckiness" as one resident reflected, or is "accident cursed" as another commented, after both witnessed yet another traffic collision there. This crash, at the same cursed crossing we've reported on several times this year alone, was on Tuesday afternoon, August 7, at 4:47 p.m. The driver of a Honda Element told THE BEE she'd been headed eastbound on Duke Street, and slowed at its intersection at S.E. 72nd Avenue, but had proceeded through on a green traffic signal. As the Honda entered the intersection, the driver of a Ford Explorer SUV apparently didn't notice it had a red light and smashed into the Honda – and momentum carried it over the sidewalk, and into a nearby convenience store parking lot, where it knocked over the market's steel sign post, narrowly missing a Toyota Camry that was parked in the lot. An attending police officer indicated a citation might be issued to the driver who reportedly ran the red light. 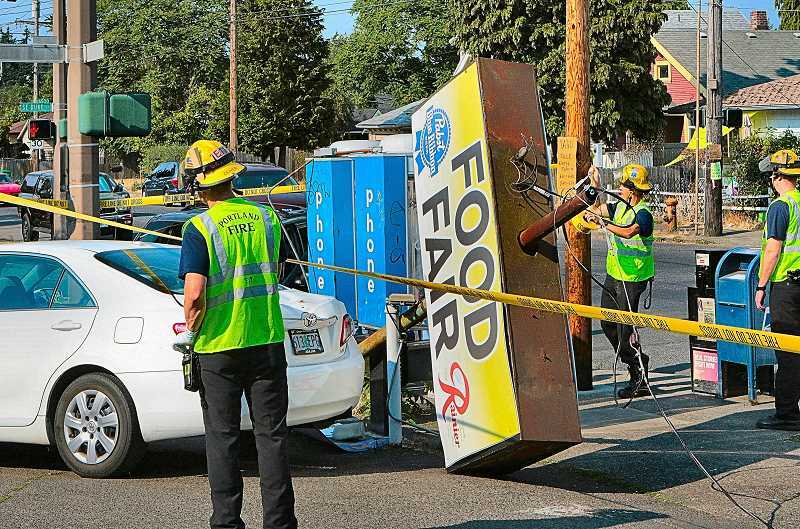 Portland Fire & Rescue Engine 11's paramedics checked over those involved in the smashup, and a waiting ambulance was eventually waved off from the scene – those involved weren't seriously injured. But their vehicles, and the market's sign, were not so fortunate.